A: Indeed, since I was a graduate student, I was motivated to do research. The topic of my research papers derives from the work I face and work on in daily practice. However, in practice, people on the business side are only interested in solutions and tools they can apply to generate P&L and not in academic papers. At the same time, it is useful for me to understand the theoretical details of models that I implement with the goal to improve them. In the end, I find it very useful for my own understanding of the models and ideas to write them down and explain them to other people. As a matter of fact, this research skill makes me confident to look for solutions on my own, whenever I face a new problem, and only after to check related literature. More often than not, I discover my solution approach is somehow original and useful. Nevertheless, despite my academic credentials, I always seek for simple solutions and I stick to Leonardo da Vinci principle that “the simplicity is the ultimate sophistication”. Q: Is quant analysis necessary for option trading or is it just the way you personally approach the world? Quant analysis is absolutely necessary for option trading. Hereby, by option trading, I mean trading the realized versus implied volatility and some other statistical moments of asset returns. Option trading is not about the trading of the direction of the underlying asset. As an example, covered calls and naked put selling are simple and popular option strategies. Yet, the long-term performance of these two strategies are attributed to the spread between implied and realized volatilities, not to the drift of the underlying asset. As a result, we need to quantify the implied and realized volatilities and generate signals out of them. The volatility is a model specific concept so, as a result, we need quantitative approaches to define and measure both implied and realized volatilities. Q: You have done a lot of work on pricing models. To what extant do these have demonstrated advantages over BSM with ad hoc modifications for skewness etc? A: A lot of people, especially those in academia, confuse BSM with a proper model that accurately reflect the statistical properties of asset returns and their dynamics. Still, for most of practical trading applications, BSM serves only as a tool to trade options. The obvious advantage of this tool is that, in most of cases, it requires only two numbers, the implied and realized volatilities, to get understanding of the potential risk-reward and to initiate a trade at a micro-level. Obviously, we can use more complicated models for forecasting of the realized volatility and possibly for the statistical distribution of future price returns, but, at the end, trade signals should be generated using the BSM tool. About the skewness, again, it is all about what is implied in option prices at the trade initiation and what is realized up to when the option expiries. The volatility implied using BSM formula contains a compensation for taking the skewness risk, which for me is the risk of realizing large drawdowns in asset prices. However, this compensation is static in the sense that it is proportional to the average probability of drawdowns, while in practice the realized occurrence of drawdowns is always binomial. As a result, if no drawdown is realized, a short volatility trade will most likely generate a positive P&L, and, in opposite, if the drawdown in the underlying asset is realized, the short volatility trade will go through a similar drawdown. What matters the most when we have a portfolio of option trades on several stocks and asset classes, is the timing of drawdowns and their joint magnitudes. For proper risk-management, it is then essential the diversification of the drawdown risk, which means we need to weight our allocation to assets where drawdown will most likely to occur at different times (think of, stocks and sector ETFs, govvies and credit, FX, commodities, etc). To conclude, on one hand, BSM is a great tool to generate and execute option trades at the micro-risk level, with implied and realized volatilities being good indicators on the risk-reward of a single trade. On the other hand, BSM cannot be applied for the macro-risk management of options portfolios on multiple asset classes with volatilities and correlations being poor indicators for the risk management. For proper risk-management, we then need a model that takes into account the cyclicality and drawdown risks of several asset classes. Q: Your presentation at global Derivatives 2016 briefly mentioned the idea of using different sizing in different volatility regimes. How do you forecast what regime you are likely to be in for each trade? A: Well, I experimented with many econometric models for statistical inference and applications for trading. I find that the regime-based models have the strongest explanatory power on both: the statistical and fundamental levels. I developed a proprietary method for portfolio allocation utilizing long-term and short-term volatilities. 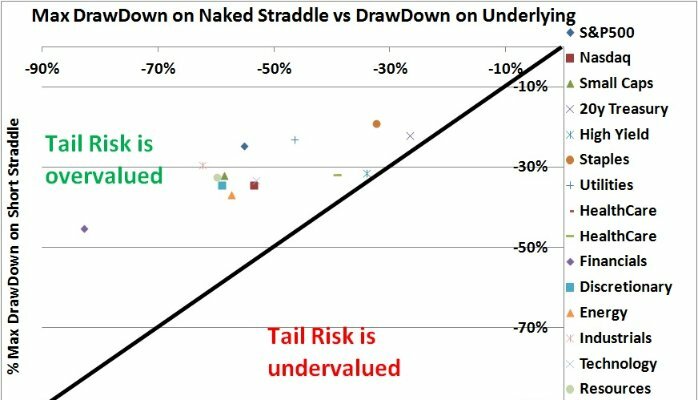 The key is to minimize the risk of drawdowns for the portfolio and adjust your exposures dynamically. I avoid using expected return or alpha for position sizing. On one hand, for short volatility strategies, the alpha is realized though a relatively long-time period. On the other hand, allocation models using recent returns tend to over-concentrate the allocation to recent winners. As a result, I am applying allocation methods using as fewer assumptions as possible to reduce the estimation risk and portfolio turnover. Q: You recently gave a presentation that was focused on collecting the volatility premium. What expiration (weekly, one month, two month etc) do you think has the greatest premium? A: When we trade the volatility premium, one of the important considerations is the maturity-decay of the volatility skew. On the expected return side, when selling out-of-the-money put volatility, it is beneficial to sell short-dated puts with the steepest volatility skew. However, on the risk side, the short-dated options produce higher volatility because they are very sensitive to the gap risk. When selling out-of-the-money call volatility, the short-dated skew is too steep, which makes implied volatilities of short-dated calls to be too small relative to historical volatilities and, as a result, produces an adequate risk-reward balance. As a result, for selling call volatility it is more beneficial to trade in longer-dated calls with flattish skew. To conclude, I find that to sell puts, the most beneficial maturity is between one and two months, while for selling calls it is about two to four months. I have a paper on the optimization of Sharpe ratio for volatility strategies with quantitative tools for such an analysis. Finally, I do not trade in options with maturities of less than one week, because it requires a more frequent trading with higher transaction costs. However, for liquid underlyings, I do trade in options with maturities other than the third Friday to spread out my exposures. Q: What books or educational materials do you most strongly recommend? A: For understanding of the psychology of trading, I strongly recommend “Reminiscences of a stock operator” by Lefevre. It’s a great book about how we can trade, but, by all means, we must not trade like that. The lines between gambling, speculation and investing are indeed very thin. It all comes down to our psychology to understand whether we are gambling or making calculated bets and when we cross the lines. That’s why “Reminiscences” offers a wealth of experience and knowledge from a big speculator. I actually have two prints of “Reminiscences” – the illustrated and annotated editions as they both offer a unique perspective of the environment and psychology of speculators in the late 19th and early 20th centuries. I find that each paragraph of the book is filled with deep thoughts and, ultimately, the drama of a person who is able to take big, but calculated, risk. However, in the end, he falls victim to his own personality when he stopped being a speculator and turned into a gambler. Throughout each page, the book stresses the importance of the right psychology and mindset for the long-term success in trading. I think the key lesson from the book is that we need to see and anticipate the trends, always make our trades conditioned on some future developments and their realizations, and adjust trades once a new set of information becomes known. I think it is the ability to differentiate between the noise, which we see in everyday changes in market prices, and the trend, which infrequently changes its direction when a new set of information is revealed, that makes our investing successful in the long run. That is why I believe it is important to apply and follow fundamental and quantitative models for making investment decisions and for minimizing the impact from our psychological biases. For a good review of quantitative strategies across all asset classes, I recommend “Expected Returns” by Ilmanen. The book offers a nice overview of authors own work as a practitioner and academic as well as of a wealth of other studies. The books covers all asset classes, including treasuries, credit, volatility, FX carry, etc, and, importantly, what factors drive expected and realized returns for each asset class. I find that the key lesson from this book, is to avoid the directionality and the market beta. For an example, let’s say we want to bet on decline in long-term treasury rates. On the one hand, we could invest in 30 year treasury bond, on the other hand we could invest in 10 year bond with leverage to match either the duration or the volatility of the first options. It turns out, that empirically the second choice even though leveraged produces higher return that the first one. In fact, across many different asset classes we observe a hump shape of the Sharpe ratio, with exposures to medium-risk opportunities providing better risk-adjusted performance compared to the most risky one. I always suggest this principle for any or my own investing: given my view, I choose a suitable investment with the smallest potential downsize risk and then leverage it to a target volatility. For option trading I recommend two of your books, “Volatility trading” and “Option trading“. Your book offers good insight into what it makes to trade options from volatility estimation, delta-hedging, to position sizing. It is also very good that you have a whole chapter devoted to the psychology of trading. As we already discussed, the psychology is one of the keys to the long-term success, especially so for option trading. In fact, in my opinion, to make option trading profitable we must bet on the mean-reversion of asset prices and sell expensive volatility which overprices tail events. In opposite, for a profitable long-term trading we must bet on trends, however, we must trade in the underlying asset because buying volatility is too expensive in the long-term. Option trading in the portfolio content allows us to combine trading in both mean-reversions and trends. However, we need to have a right mindset and proper quantitative models to benefit from it in the long-term. For long-term investing in stock market, I recommend “The single best investment: creating wealth with dividend growth” by Miller. It is an amazing empirical evidence that about 80-90% of long-term returns from the stock market are attributed to dividends, dividend growth and dividend re-investment. Finally, I enjoy reading research and market commentaries (all available for free access) from GMO LLC and in particular from Jeremy Grantham and James Montier. This is the type of research I find beneficial for my investing: quantitative and fundamental, long-term focused and unconventional, unlike the mainstream research from IBs. They have a couple of nice papers on the relationship between the convexity versus the concavity of returns on investment portfolios and associated market betas, and how they both affect the long-term performance. It all helped me to define my own investment approach and I benefit from it.